Today's globetrotter travelogue features photos of Ricci Sylla. This day was long day of walking and sightseeing, starting with the famed Kiyomizu Temple. On the way there, we passed this ceramics store walking along Higashi Oji Dori from the train station. Travelers from San Francisco, Los Angeles, San Diego, and Manila. Here is almost everyone who joined the Kyoto part of our Japan trip. Not pictured are Tito Peng and Ralph. 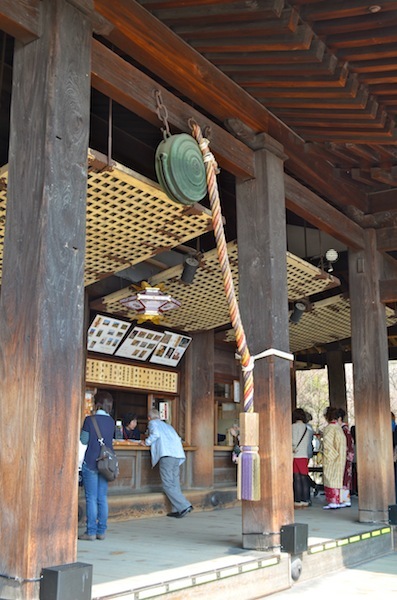 Otawa-san Kiyomizu-dera is a Buddhist temple founded in 778 and takes its name from the waterfall within the property. Kiyomizu means pure water. This present structure was built in 1633 and does not use a single nail in its construction. There are two love stones 20 feet apart. If you can walk from one to another blindfolded, you will find your true love. Write your troubles down on the paper angel and then drop it in the water. It is believed that your worries will dissolve with the paper. Water from the Otowa waterfall is believed to have wish granting powers. A major thanks to my sister Ricci for sharing her fabulous pictures!